Crafty Andy: We have EARS! As you all know by now, I have been working on Dachshund Heidi. 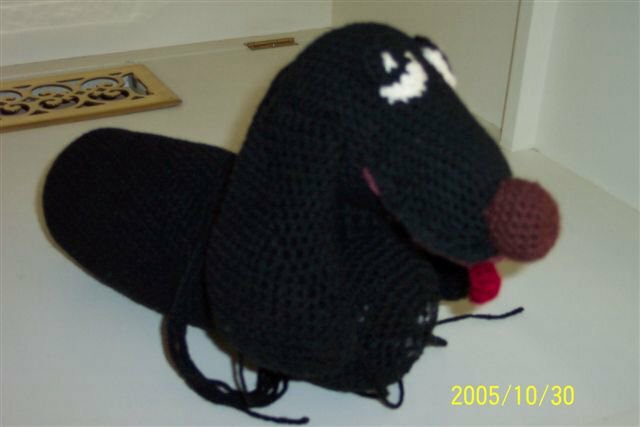 A stuffed animal created by Scott Hooper. The pattern is definitely not for the begginer crochetter, yet it can be done if enough patience is in store by a begginer. Here we have the progress so far on Heidi. I have the Ears made during the weekend and I was able to attach the head to the body. I am also working on Drew Emborsky's Do your Vest! pattern and should be done with the shoulder section this week. I really like the pattern it's very easy to make. Today is Halloween, is not a holiday, but kids and some adults like this dressing up. I really enjoy the costumes, I can do away with the drinking. I will share with you a picture of mine from the past that shows me in a Halloween custome I made. I made this costume and I wore it for up to 12 years. 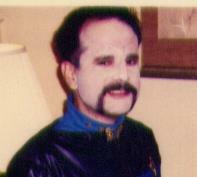 The make up was a Bajoran Male with a beautiful Prosthetic Nose, which I made. Trick or Treat!!! But did you also wear the Bajoran earpiece? If not,then shame! LOL! Woo hoo! man after my own heart. I admit I have done 'the nose' at Trek Cons once I got interviewed for a newspaper because of it LOL and I posed for more people's pictures than I can count. Great costume! Peldor Joi!!! !